This mains powered smart security light by Ring includes LED spot lights, a HD 1080p security camera and an integrated alarm siren. Instant alerts when motion is detected. Motion activated camera and spot light. Schedule or manually trigger spot light and siren. Wide 140 degree viewing angle. Up to 10m PIR read range. Adjustable PIR detection zone, up to 270 degrees. Ring	The Ring Spot Light Camera - Black (Wired) is a motion activated security light with two LED spot lights, a video camera with high quality HD 1080p resolution recording and an integrated alarm siren. The bright LED lights can be set to trigger once motion is detected and can also be scheduled to turn on during specific hours or can be manually triggered. The Ring Spot Light Camera connects to your home broadband from up to 9.1m away from your Wi-Fi access point and complete control is provided via a smartphone app* which allows you to monitor your property, day or night. The built in camera includes motion detection technology which will alert you if somebody is at the property and you can view live high definition footage at any time. The built in microphone and speaker allows you to hear and talk back and you can choose to trigger the 110dB siren, to warn off unwanted visitors if required. 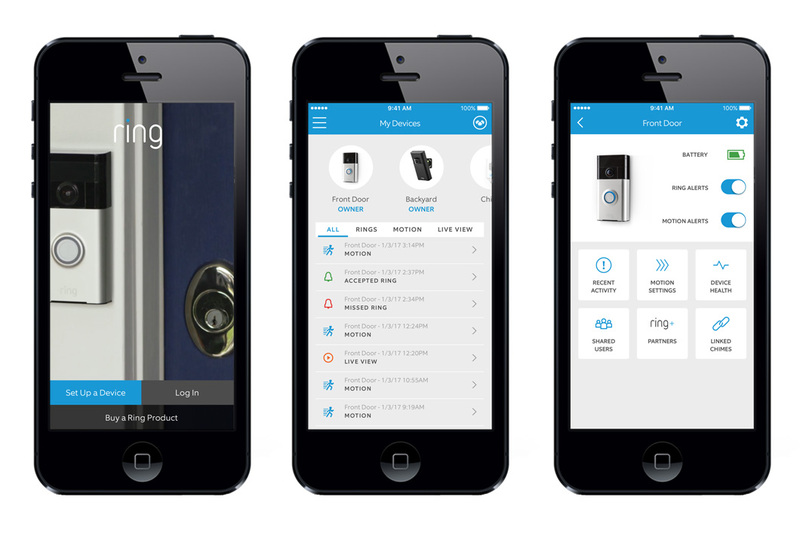 It is easy to view recorded and real time images from your Smartphone or Tablet using the Ring app* (available for iOS, Android and Windows) providing your Ring Spot Light Camera is connected to your internet router via Wi-Fi. The integrated camera allows you to view high definition HD 1080p footage so that you can see who's at the property. You can view live footage at anytime via the Ring app and the camera includes motion detection technology which alerts you when movement is detected. The camera also includes LED night vision video from up to 10 meters away providing crystal clear footage any time of day. You will receive a 30 day free trial of Ring's cloud storage feature which allows you to view recorded footage. A subscription is available for further access with monthly or yearly subscription plans available which allow you to view up to 60 days worth of video recordings. You can however, still use the Ring Spot Light Camera and receive notifications without a subscription. The Ring Spot Light Camera must be hardwired (100-240v) in to your mains power supply, providing continuous power supply without having to charge a battery. Installation should be completed by a qualified electrician for your safety and protection. A battery powered version is also available here. * Requirements: This video doorbell system requires a broadband internet connection with a Wi-Fi router located within 9.1m. SmartPhone must be iOS 8.1 and above, Android 4.1 and above or Windows 10 Mobile. PC must be Windows 10.